The Adaptation program is designed to enhance the vitality of English-speaking minority communities for health and social services in the province of Quebec through the Roadmap for Canada’s Official Languages 2013-2018: Education, Immigration, Communities. This initiative is being undertaken in partnership with the Ministère de la Santé et des Services Sociaux (MSSS). 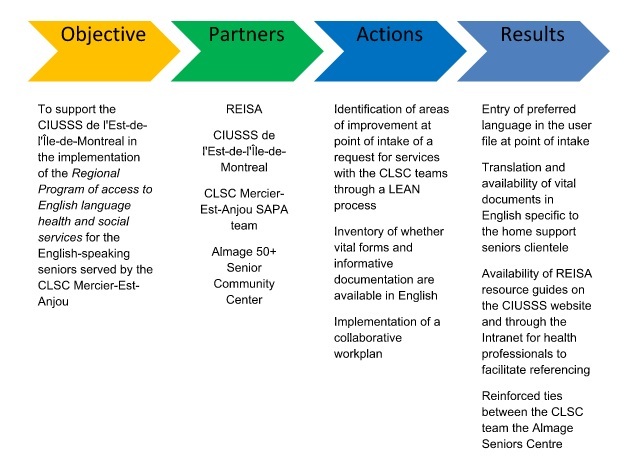 REISA receives project funding from Region 6: Improving access to services in English in Montreal. Assessing the impact of initiatives aimed at increasing access to services in English. Helping improve the organization of programs and services to enhance language access to services for the English-speaking population. Helping make information and communication documents accessible to the English-speaking population in connection with programs and services. Helping keep the English-speaking population better informed of access to services in English and to the programs and services intended for them.